Throughout the human history, information was the critical tool. Knowledge was equal to respect and influence. Access to information was pivotal to success. Knowledge was hard to obtain and therefore was regarded as the highest value. Then came the Internet. Today, any person who can type or pronounce words could get almost any information, instantly, for free. Which is the great achievement of our species. According to Yuval Noah Harari, homo sapiens succeeded due to our ability to cooperate flexibly in huge numbers. To do that we need to exchange information. Hence the Internet, the monumental step forward in the knowledge transfer. From Wikipedia to YouTube, our Internet is full of knowledge and entertainment. But it also affects our behaviour short and long term. As a kid who was growing up in the late twentieth century, when I wanted to know something I had to put some effort. Be it asking someone, going to a local library and search through books - it was some work. A kid growing up in the present time could say: "Hey Google (Alexa, Siri, Cortana...) why...?" And get the answer immediately. Minimal effort required. That's great for parents who are exhausted to answer thousands kid's "why" questions. But what kind of behaviour our modern technology reinforce? I wonder how many kids thank a virtual assistant after receiving an answer? We have "Hey, Google" but don't have "Thanks, Google". According to psychology, an appreciation is driven by the effort invested. Think about a student who comes to thank a professor who has just delivered an excellent lecture. Would the same student feel similarly grateful to all the people who contributed to a Wikipedia article on the same topic? People he never met, who might have spent days creating content he received instantly and for free. Would a person value information gained without an effort? When knowledge is free, does it become worthless? How does it all relevant to building digital products? Quite directly. Your tool design might reinforce the feeling of low value in your customer's eyes. Guess you came across people who don't trust Wikipedia or Google because they provide information instantly and for free. Those people might become suspicious or even think there is some conspiracy going on. (a necessary joke about flat Earth movement). All because they received knowledge without any invested effort. Other products approach that differently. Quite the opposite, they would complicate their tool design to reinforce the feeling of high value. Have you ever seen SAP interface? Impressive, isn't it? What is the first thought that came to your mind when you saw this? For me, it was: "how could anyone use that?" But immediately after, I thought it must be a serious, important and valuable tool. Because if someone would invest so much effort into learning how to use that - it must be worth it, right? Now add a price, a universal value representative, to an equation, and you'd receive an effective business strategy. Think about the last time you did your taxes. If you ever have done it - you'd know it never an easy or a fun task. In some countries, like in the US, tax laws are complicated. To make things right people turn to software that could help them to do their taxes. Imagine you have two tools in front of you that claimed to help you with your taxes. Both use neat forms to insert your data. It takes you a while to put all the numbers in and then you're ready to press that big green button that says "Calculate". So you click it and the first tool gives you results immediately, while the second one calculates for a while, showing you all the complicated steps it performs. But then the second tool comes back with the same outcome as the first one. Which tool would you prefer? First one? Well, not according to TurboTax experiment. They added an "illusion of labour" in their app that should re-assure their users and give them more confidence in the correctness of the outcome. When a user sees such animation the results are long ready. But the app makes you wait a bit and appreciate all the complicated calculations it does for you. 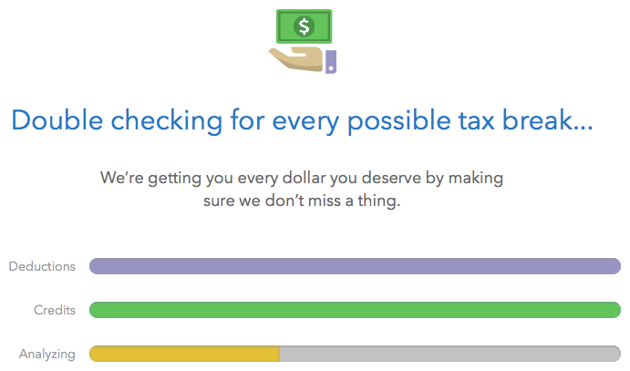 Such little animation, knowing how complicated tax laws are, could ease user's stress and give more confidence in the outcome. Video games industry has been using this trick since the very beginning. Even when a game doesn't need a loading screen, some developers decided to add it, fake it. This way they could pause to explain something important to the user, present part of a narrative or switch emotional tone. Funny enough, Apple's iOS guidelines used to promote using "fake" loading screens (splash screens) to give users the perception of responsiveness and fast app loading. You tap on the app icon, and it feels like the app starts immediately. While in reality, it takes some time to load. As our tech becomes progressively faster, there is no need for splash screens today. Still, some apps continue to use those to create an "illusion of labour" and reinforce a particular perception for their users. I guess we shouldn't be surprised if one fine day in response to your question, Google will answer: "Hm... Let me think". A takeaway for product people is to be aware of the perception they want their product to reinforce. Made it instant, simple and free? Are you ready for some people to think sceptically about it? Or maybe your design is heavy, robust and feature-rich? Then some wouldn't bother learning it if they couldn't be convinced that the final result is worth it. Thinking about your own product, you need to consider carefully whether the "illusion of labour" would add to your customer's experience. Using it as a gimmick would waste your time and the time of your users. Analyze how your product is perceived and what emotions it invokes at the crucial usage steps. You could strengthen certain perceptions and emotions by using "an illusion of labour". Whatever you do, consider thanking Google (Alexa, Siri, Cortana..) for all the hard work they do to deliver you an information you seek instantly and for free. And tell your kids to do the same. Finally, Google is adding a new "pretty please" feature that teaches kids not to just order their Assistant around. If you say "please," it'll reinforce the behavior by saying things like "Thanks for being polite!" Amazon introduced something like this a few weeks ago for Alexa, and it's good to see Google doing the same here.